This Hawker has paired spots on each abdominal segment, two broad stripes on the sides of the thorax and the costa is yellow in both sexes. The male has quite small blue spots on each segment of the abdomen and appears quite dark. The eyes are blue. The female is brown with similar markings to the male but the spots are yellow or occasionally green or blue (Scotland). The eyes are brownish. The Common Hawker is most often seen hawking over breeding areas and along the edges of woodland but wandering adults can be seen far away from these sites. Flies from June to October. This is a bog and moorland species breeding in small acid pools. The species is most common in western Britain. Rare vagrant in Leicestershire and Rutland. Due to the very close similarity of this species to both the Southern and Migrant Hawkers the current and historic distribution of this species in VC 55 remains somewhat uncertain, as many recorded occurrences seem likely to involve mistaken identity; the only record of this species on the LRDG database which is supported by a conclusive description is in the Saltersford Valley, Oakthrope, on 17th August 2001. Historic records paint a similarly clouded picture, with Longfield (1949) describing it as 'uncommon'. 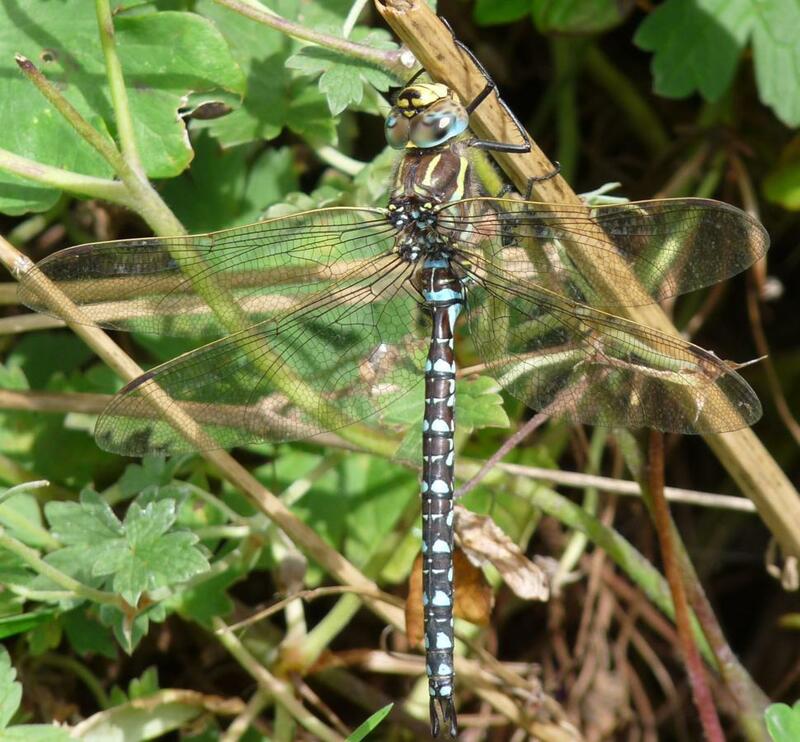 Nationally the Common Hawker is found on acidic heathlands, a habitat almost entirely absent from VC 55, and it would therefore be expected to occur here only as a rare wanderer. The closest breeding sites to VC 55 lie in the Derbyshire Peak District, some 50 km to the North West of the Leicestershire boundary.